Only 98,000 New Jobs Were Created In March, Labor Department Says : The Two-Way After adding more than 200,000 jobs in each of the first two months of 2017, the number of jobs added last month was about half what analysts had expected. The unemployment rate fell to 4.5 percent. 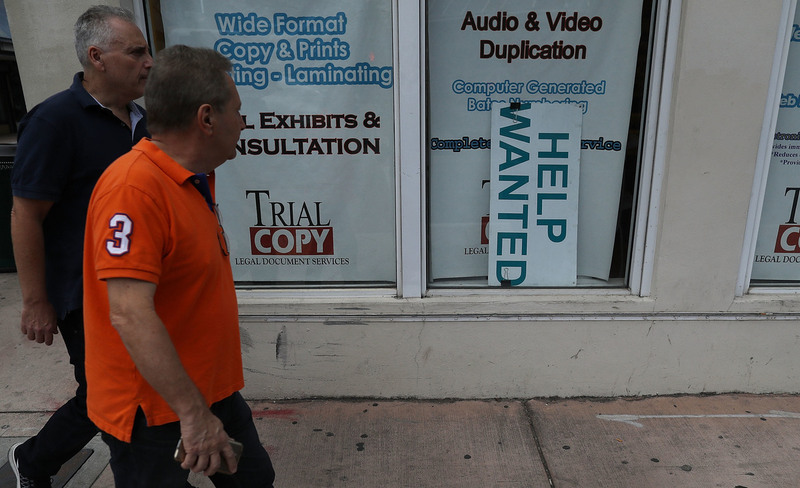 A "help wanted" sign hangs in a storefront window in Miami last month. The Bureau of Labor Statistics says nonfarm payrolls increased by 98,000 in March, far below analysts' expectations. After adding more than 200,000 jobs in each of the first two months of this year, the U.S. economy gained only 98,000 jobs in March, according to the monthly report released Friday by the Bureau of Labor Statistics. That result falls short of expectations: While analysts had anticipated a slight dip to around 180,000 new jobs, they had been looking for signs that job growth would keep pace with recent gains. Unemployment fell to 4.5 percent from 4.7 percent, the Labor Department agency says. That's the lowest rate since May 2007. In addition to the data for March, the BLS also stripped nearly 40,000 jobs from its previous estimates for January and February, revising its findings for those months from 238,000 to 216,000 for January and from 235,000 to 219,000 for February. "Over the month, employment growth occurred in professional and business services (+56,000) and in mining (+11,000), while retail trade lost jobs (-30,000)," the BLS says. The agency adds that the health care sector stayed on its positive trend, adding 14,000 jobs in March. In the first three months of 2017, the BLS says, "health care added an average of 20,000 jobs per month, compared with an average monthly gain of 32,000 in 2016." One trend from the report is clear: Retail is in a mess of trouble. With 30,000 jobs lost in March, the sector has seen 89,000 jobs eliminated since last October. It's a pretty dire situation for brick-and-mortar retailers that are facing relentless pressure from Amazon; slowing traffic at shopping malls; and overcapacity — too many stores in many parts of the country. Retailers are cutting jobs because the future looks bleak; they're consolidating in order to survive. Just look at the recent tally. This week, Payless filed for bankruptcy protection and announced it's shuttering 400 stores. J.C. Penney is closing its doors at 138 locations. Macy's is in the process of shuttering 15 percent of its department stores. Last month, Sears warned that there is "substantial doubt" it will survive. And this week, Ralph Lauren announced it will close its flagship store on Fifth Avenue in New York. These are not incidental or unconnected events. On an earnings call last month, Richard Hayne of Urban Outfitters said a retail building boom in the 1990s and early 2000s "created a bubble, and like housing, that bubble has now burst." The U.S. now has more than six times as much retail capacity per capita as Europe or Japan, Hayne said. So it's safe to assume that retail employment will not be rallying anytime soon. Among the questions that are still unanswered: How important is retail for the American workforce and the economic recovery? Retail jobs don't normally pay very well. The median wage in 2016 for retail salespeople was $22,680. But the jobs of retail salesperson and retail cashier are the two most common in the country. And together it's estimated they employ more than 8 million Americans. Average hourly earnings continued a recent rise for employees on private nonfarm payrolls, increasing by 5 cents to $26.14. That follows a 7-cent increase in February. For private-sector production workers and employees who aren't in supervisory positions, the average hourly wage rose to $21.90 — a 4-cent gain.